By the time you read this thankfully all the campaigning will be over and we’ll know one way or the other. There’s been a bit of a difference of opinion in the Cooper household. Hubby and I have homed in on different merits for and against remaining/exiting the EU! Seeing things from different perspectives extends far beyond which way to vote in the EU referendum. When I’m coaching managers to get the best from their team or training staff in dealing with customer complaints encouraging them to see things from other people’s perspectives is such an important part of resolving difficult situations. One technique uses that of perceptual positions, which helps you imagine what difficult situations look like when viewed through others’ eyes, in other words to imagine what others perceive by imagining that you are that other person. First position is your natural perspective. You are fully aware of what you think and feel regardless of those around you. This is of course the perspective we find most familiar. But as you focus on it you may only then start to realise what is important to you and what you want from this interaction. You will probably become more aware of what you believe and value, and more likely to be assertive about your own needs. 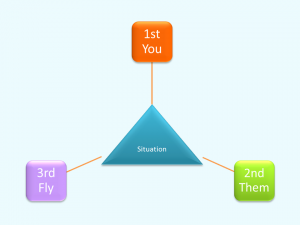 Second position is about stepping away from our own position and imagining what it’s like to be the other person, experiencing the situation as they would.Some people are very good at considering others’ needs and concerns; for others imagining second position can be a completely alien view. When you are really in their shoes everything you do or say makes perfect sense to you. When you do this well you start to get a sense of what the other believes and values; what is important to them, and a better understanding of what they want. And the better you get at this the more empathy and rapport you create. You might even be able to predict how they might respond in this situation. You are certainly in a better position to offer better customer service to a customer support to a team member. Third position is an independent position where you act as a detached observer noticing what’s happening between two other people. I like to think of this as the ‘fly on the wall’ or ‘The Consultant’s perspective’ What is important is that this position is an impartial insight into a situation.Imagine you are watching and listening to each of the people involved as they communicate without getting involved yourself, without having to feel their feelings and emotions. From this new perspective, you more likely to get an overview of the situation, the bigger picture. You can start to notice patterns and become aware of similarities and differences between the parties involved, and you’re better able to analyse the situation logically with less emotional involvement. What’s also important is you can start to see yourself as others see you. From this position what advice would you give ‘first position’? It can be particularly useful when you are dealing with a situation where you are having strong negative feelings towards the other party, or do not understand their actions. When a team member is acting in a way that you find destructive to the task in hand, or negative towards others in the team. It doesn’t just help in negative situations, it can also help clarify the way forward in for example sales situation when it will help to see things from the clients’ positions or in a consultant position to see the situation better and help the client achieve their outcomes easier. It works best when you physically change position when moving from 1st position to 2nd position and then 3rd position; e.g. in 2nd position move round to sit or stand when the other person would normally see or stand when you meet with them, and when the ‘fly on the wall’ stand up and physically look down on the situation. The real learning comes by stepping out of first position to explore second and third positions and see what light it sheds on a situation.